Life is full of choices. At times, we get carried away with our ability to choose between obedience and disobedience. We forget that this choice is a test, not a mark of our authority. In academic exams, those that studied hard would be able to answer correctly, whilst those that did not study would answer incorrectly. Both take the exact same paper, but the former will pass whilst the latter will fail. The exam is taken by all, not just the hardworking students. Likewise, is life. 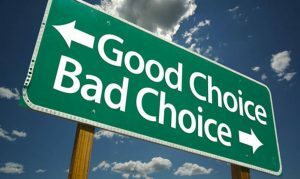 We are living an exam, those that sin unrepentantly are exercising their choice for which they will soon pay the price. Upon death, this ability will cease to exist. Have you ever seen a deceased man come out of his grave, refusing to be buried? No, because he has no choice. We must not allow it to delude us into thinking we have control over our lives. On the Day of Judgement, our own limbs will speak out against us so what control do we assume, when our own limbs will be out of our control? When the adhaan calls, you can choose to sleep or wake up for prayer. That is a test. Do not be deceived, your choice will not last for long. When the trumpet is blown, no one will be able to continue sleeping. We will all awaken and march in the same direction, towards an inescapable reckoning. Therefore, in this worldly life, choose wisely. Those that do not follow Deen, outwardly, it may seem that they are free and in charge of their lives. But in reality, their choices are answers being recorded on this exam of life, for which they will soon pay. Our choice is only given to write this paper. Upon death it will be taken away from all, and gifted back to those who enter Jannah. There in the gardens, their choice will no longer be a test. It will be a blessing via which they will live and do as they please. May we be amongst them, Aameen.